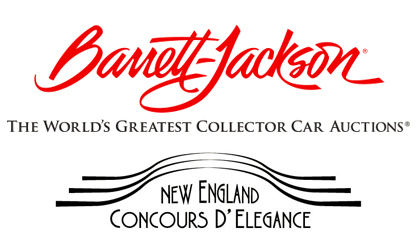 West Hartford, Conn. – March 2, 2017 – Barrett-Jackson will be the presenting sponsor of the New England Concours d’Elegance in June, to be held at Mohegan Sun Resort and Casino from June 17th through 19th, 2017. A portion of event proceeds will support organizations benefitting veterans and children fighting cancer, as well as to promote the collector car hobby.The event is now accepting car entries, and tickets can be purchased at the Concours website,www.newenglandconcours.org. The weekend will begin with an open event on Saturday, June 17, in the Turtle Lot at Mohegan Sun. For just a $10.00 contribution per vehicle, the first 300 cars will be admitted to this special day featuring customs, hot rods and muscle cars and more. The weekend continues on Sunday, June 18, with the annual New England Concours d’ Elegance. Over 100 of the world’s finest cars will be competing on an invitation-only basis. A couple of individual collectors will be honored for their contribution to the hobby, and the prestigious Best in Show trophy will be presented by Barrett-Jackson officials at approximately 4:30 PM. Monday, June 19, will feature a New England road tour culminating in a private preview of some of the best collector cars Barrett-Jackson will be offering in their Northeast Auction and an opportunity to meet some Barrett-Jackson representatives.